Speranza is in many ways Turnage’s most ambitious and symphonic composition for orchestra to date. The piece is a monument to the power of optimism in a bleak world—‘I started working on the piece while thinking about the absence of hope. I wanted to lift people up’, says Turnage. Each of the four movements are titled ‘Hope’ in a different language; Arabic, German, Irish and Hebrew. 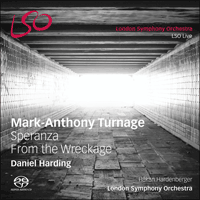 Speranza is coupled here with From the Wreckage, described by The Times as ‘outstanding: the music begins hellishly but gradually picks up a bluesy swing …’. Premiered in 2005, the piece was written for Håkan Hardenberger who reprises the role of soloist for this release. The three internal sections of From the Wreckage are marked by the soloist’s change of instrument—first flugelhorn, then trumpet, and finally piccolo trumpet. In some ways Mark-Anthony Turnage’s Trumpet Concerto follows a trajectory similar to many works in the orchestral repertoire. The journey, via a process of inner struggle, from a state of darkness into one of light is, after all, one of the great emotional archetypes of musical form. But unlike, say, the great Fifth Symphonies of Beethoven, Tchaikovsky, and Nielsen, Turnage’s compact piece does not share the heroic statements of these earlier works. Its psychology relates to a much more modern frame of mind, one in which the crisis is less overcome than simply worked through, resulting in a state of mind in which the agony becomes tolerable. The work is composed in a single movement, but a three-part division is perceptible in the changing atmosphere, itself further articulated by the soloist’s moving from the dark-toned flugelhorn to the standard trumpet and eventually, for the third part, to the piccolo trumpet. The opening suggests horror rather than tragedy. Subtle but uncanny screeches in the strings and unsettling flares from the percussion provide a background to the nervous, centre-less meandering of the soloist. The subsequent, jazz-inflected syncopations introduced during the first tutti, and the misty flow of the ensuing solo entry, seem initially to afford few comforts, but the sense of the trumpet exploring half-familiar territory eventually dispels the sense of underlying panic. True to form, there is no Beethovenian conquering-over-adversity at the end. Rather, the opening’s uncertainties are simply rendered less threatening and the piece seems less to end than simply to exhale, winding out on a shimmering chord and a last shake of the snare. Originally written for this performance’s soloist, the Swedish trumpeter Håkan Hardenberger, From the Wreckage is remarkable for the way it captures such a wide spectrum of colour and expression from its solo instrument. Turnage’s affinity with the instrument stems partly from the pieces—such as Night Dances (1981) and the double trumpet concerto Dispelling the Fears (1994)—in which his love of jazz first penetrated and revolutionised his musical style. The piece also eschews the traditional concerto idea of making adversaries of soloist and orchestra, the latter acting more in the manner of an ancient Greek chorus by setting and colouring the scene and responding to the plight of the troubled protagonist. Par certains côtés, le Concerto pour trompette de Mark-Anthony Turnage suit une trajectoire similaire à de nombreuses œuvres de ce type. Le cheminement de l’ombre à la lumière par un processus de lutte intérieure est, il est vrai, l’un des grands archétypes émotionnels de la forme musicale. Mais au contraire de partitions antérieures comme les grandioses Cinquièmes Symphonies de Beethoven, Tchaïkovski et Nielsen, cette pièce dense de Turnage ne se lance pas dans des déclarations héroïques. Sa psychologie est liée à un cadre de pensée beaucoup plus contemporain, où l’on apprend à traverser la crise plus qu’on ne la surmonte. Il en résulte un état d’esprit où la souffrance extrême devient soutenable. L’œuvre est constituée d’un mouvement unique, mais les changements d’atmosphère dessinent une division en trois parties, qui s’articulent à leur tour selon le cheminement instrumental du soliste: du bugle, avec son timbre sombre, à la trompette traditionnelle et même, dans la troisième partie, à la trompette piccolo. Le début suggère l’horreur plus que la tragédie. Des stridences subtiles mais sinistres dans les cordes, ainsi que des embrasements inquiétants de la percussion forment l’arrière-plan des lignes sinueuses et nerveuses, dépourvues de polarité, du soliste. Ensuite, les syncopes aux inflexions de jazz introduites pendant le premier tutti, puis le flot vaporeux à l’entrée du soliste semblent tout d’abord offrir peu de réconfort, mais la sensation que la trompette explore des territoires plus ou moins familiers finit par dissiper le sentiment de panique latent. Pour rester fidèle à la forme choisie, il n’y a à la fin aucun «triomphe sur l’adversité» beethovénien. Ce que l’on ressent plutôt, c’est que les incertitudes initiales ont simplement perdu de leur caractère menaçant; la pièce donne l’impression moins de se terminer que d’expirer, se dénouant sur un accord chatoyant et un dernier tremblement de la caisse claire. Ecrit initialement à l’intention du soliste de ce disque, le trompettiste suédois Håkan Hardenberger, From the Wreckage [«Du naufrage»] est remarquable par l’étendue du spectre de couleurs et d’expressions qu’engendre l’instrument soliste. L’affinité de Turnage avec la trompette provient en partie des pièces dans lesquelles son amour du jazz a pour la première fois pénétré et bouleversé son style musical—notamment Night Dances (1981) et le double concerto pour trompette Dispelling the Fears (1994). From the Wreckage évite en outre cette façon, courante dans le concerto, de considérer le soliste et l’orchestre comme des adversaires: le second se comporte davantage à la manière d’un chœur grec antique, brossant le décor et colorant la scène, et offrant une réponse à la détresse et au trouble du protagoniste. In gewisser Weise schlägt Mark-Anthony Turnages Trompetenkonzert einen ähnlichen Weg wie viele andere Werke im Orchesterrepertoire ein. Der Verlauf von einem Zustand der Dunkelheit zu einem des Lichts vermittels eines Prozesses innerer Auseinandersetzung zählt ja zu den gestandenen emotionellen Urtypen musikalischer Form. Aber im Gegensatz zu den großen 5. Sinfonien von Beethoven, Tschaikowski und Nielsen weist Turnages kompaktes Stück nicht die heroischen Äußerungen dieser älteren Werke auf. Die Psychologie von Turnages Trompetenkonzert bezieht sich auf eine viel modernere Lebenshaltung, bei der die Krise weniger überwunden als schlicht durchgearbeitet wird und damit zu einer Einstellung führt, mit der sich die Agonie ertragen lässt. Das Werk besteht aus einem einzigen Satz, in dem sich aber durch Stimmungsänderung eine Dreiteilung erkennen lässt. Die wiederum wird durch den Wechsel des Solisten vom dunkeltönigen Flügelhorn zur üblichen Trompete und im dritten Teil schließlich zur Piccolotrompete noch verstärkt. Die Einleitung weckt eher den Eindruck von Schrecken als Tragödie. Subtile, wenn auch unheimliche Schreie in den Streichern sowie beunruhigende Ausbrüche vom Schlagzeug liefern einen Hintergrund für das nervöse, ziellose Herumschweifen der Solotrompete. Die darauf folgenden jazzigen Synkopen, die im ersten Tutti vorgestellt werden, und der neblige Fluss des Soloeinsatzes danach scheinen anfänglich wenig Trost zu spenden. Schließlich zerstreut jedoch das Gefühl, die Trompete erkunde halbvertrautes Terrain, den Eindruck dahinter liegender Panik. Wie zu erwarten gibt es am Ende keinen Beethoven’schen Sieg über den Widerstand. Stattdessen klingen die Unsicherheiten des Anfangs weniger bedrohlich, und das Stück scheint beim Erschlaffen auf einem schimmernden Akkord und mit einem letzten Zittern der kleinen Trommel weniger zu schließen als zu verhauchen. From the Wreckage entstand ursprünglich für den Solisten der hier vorliegenden Interpretation, den schwedischen Trompeter Håkan Hardenberger. Das Werk zeichnet sich durch sein Geschick aus, eine breite Palette von Farben und Ausdrucksformen für sein Soloinstrument einzubeziehen. Turnages Neigung zu dem Instrument entwickelte sich teilweise in den Stücken—wie z. B. Night Dances [Nächtliche Tänze] (1981) und das Konzert für zwei Trompeten Dispelling Fears [Befürchtungen zerstreuen] (1994)—in denen die Liebe des Komponisten zum Jazz erstmalig Eingang in seinen musikalischen Stil gefunden und ihn revolutioniert hatte. Das Stück wendet sich zudem gegen das traditionelle Konzertkonzept, bei dem sich Solist und Orchester als Widersacher gegenüberstehen. Das Orchester übernimmt eher die Rolle eines altgriechischen Chors, der ein Umfeld schafft und färbt sowie auf das Elend des geplagten Protagonisten reagiert.